Since committing to Michigan before his junior season, Glenn Robinson III has gone from a nice prospect with a famous name to a blue chip with an impressive game. Glenn Robinson III was angry, and someone had to pay. Hours before he and his Lake Central High School teammates tipped off against Valparaiso High School on Feb. 9, the final rosters for the 2012 McDonald's All-American game were released. Robinson's name wasn't on the sheet. And someone was going to answer for it. "I remember that day," says Robinson, a 2012 Michigan basketball signee. "I was pretty upset about that. "That would have meant a lot to me." Lake Central coach Dave Milanusnic remembers that day, too, saying he could sense a bit of anger and frustration in Robinson's demeanor leading into the game. 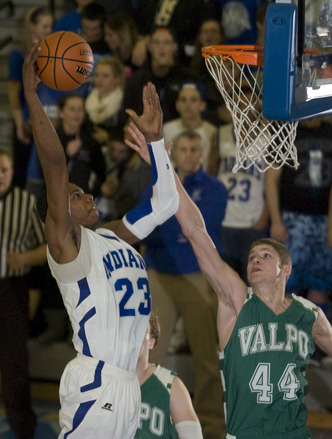 The day he learned he wasn't selected for the McDonald's All-American game, Glenn Robinson III, left, scored 24 points and pulled down 16 rebounds against Valparaiso. Living less than an hour from Chicago in Saint John, Ind., an appearance in the McDonald's game not only would've validated Robinson -- the son of former NBA and Purdue great Glenn "Big Dog" Robinson -- as one of the top high school players in America, but it would have also given him a chance to perform on a national stage near friends and family. But it didn't happen. And Robinson had a point to prove. "He was mad that day, and we had a game that night," Milanusnic recalled. "I could tell he had a chip on his shoulder, and I knew it bothered him. "But he took it as, 'I didn't make it, I've got work to do.' "
That night, Robinson put in his work. He dropped in 24 points and pulled down 16 rebounds as Lake Central ran by Valparaiso to claim the school's first Duneland Athletic Conference championship. "I had a pretty good game," he said. "I wanted to go out there and show everyone that I thought I should've made the team. I got in the gym extra early that day. "A couple hours early, I wanted to show everyone what I had." The snub served as added fuel for Robinson, but it was far from a foreign feeling. When the 6-foot-6 swingman made his commitment to Michigan coach John Beilein prior to his junior season, Robinson was mainly a fringe high-major prospect in the eyes of national recruiting analysts. Upon his verbal, he was rated as a three-star prospect. The spring following the 2010-11 season, he moved up to No. 90 in Scout.com's top 100. After a impressive summer of AAU basketball, he moved up to No. 39. Now, after a banner year at Lake Central and a recent MVP performance in the ESPNHS All-American Championship game, Robinson is rated as the No. 28 player in the country by Scout.com and is on the fringe of becoming a five-star recruit. He'll join five-star power forward Mitch McGary (a close personal friend) and four-star guard Nik Stauskas in Beilein's top 10 class for 2012. Robinson's gone from a nice prospect with a famous name to a blue chip with an impressive game. He's turned into the player Beilein and company thought he could become nearly two years ago. With his Michigan career set to begin next fall, Robinson says he can't wait to show the coaching staff that showed so much faith in him exactly what he's all about. "Those guys believed in me before anyone else really did, and that means a lot," Robinson said. "I really knew I wanted to go there (right away), they have a great coaching staff and their job is to see how players might progress in their upcoming years, not necessarily what they are right now. "I believe some schools look too much into what a player is right now, and not what their potential could be. Michigan did a great job with that, though, and that's what I really liked about them." As far as next season goes, Robinson says he's currently putting in extra time on his 3-point shooting and his ball handling. He said the Michigan staff would like to use him as both a small forward and shooting guard next season, meaning he could be relied on to attack the rim off the dribble, distribute and score from deep. Last season at Lake Central, Robinson did a bit of everything, and concluded his career as the school's all-time leading scorer. Milanusnic says Robinson's game most likely translates to college as a small forward, but added that his overall skill level as a perimeter player is much better than generally advertised. "Something you don't see in all-star games is that he's got a pretty good pull-up jumper," Milanusnic said. "He's really strong at taking a couple hard dribbles, stopping at 15 to 17 feet, elevating and shooting over a defender, and that's probably the strongest point of his game. "When people initially took interest in him, it was because of his mid-range game. But he wasn't quite as athletic and long as he is now. He's gone from a kid that people used to say 'God, he shoots the mid-range jumper too much,' to a kid that's now finishing at the hole and you don't see as much of his mid-range game. But I imagine you'll see more at the next level." Robinson will never get the chance to play in the McDonald's game back. But that's fine by him. He's heading to Michigan in the fall, and he's got plenty of time to continue transforming the opinions of non-believers. So long as there are any left to transform. "Hopefully they might have a little regret for not (picking me)," Robinson says. "Hopefully I've changed a few minds." Tue, Apr 3, 2012 : 10:35 p.m. 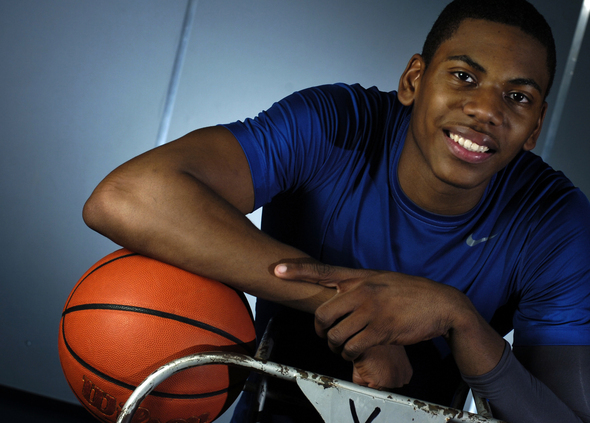 I can't wait to see GRIII playing for Michigan. He's supremely talented and seems to be getting better and better as each month passes. Give huge credit to John Beilein and staff for identifying this young man early and believing in him before other schools did. Tue, Apr 3, 2012 : 2:45 p.m.
Tue, Apr 3, 2012 : 2:23 p.m.
welcome aboard. those who stay will be champions. Tue, Apr 3, 2012 : 11:19 a.m. It would be nice if the son of the Big Dog would come in here and revive the program. My guess is that this is a one and done again. Personally I am tired of all these guys coming in for a year or 2 and leaving. I love the fact that Douglas and Novak stayed for the full 4 years and left with a championship. They had no chance when they started. They did a great job by working. We are being used by all these stars when we could build a great team with more committed players that hung around a while. After 4 years a lot of lesser talented players would make a fine team. Tue, Apr 3, 2012 : 4:22 p.m.
Has U of M ever had a one and done player? I think Webber was the only one with that level of talent at such a young age. The last two who left early have paid for it. However, they were two and three year players. Personally, I would welcome a one and done and some say that McGary is that caliber of talent. Maybe we'll have our first! Tue, Apr 3, 2012 : 10:17 a.m.
Let's hope we can finally build a championship contending team. Hopefully Beilein's recruiting can get us there, let's hope we never see another Stu Douglas or Zach Novak leading our team.